"That&apos;s incredible!" Sarah said, gushing. "Just think of the progress you&apos;ve already made on the team. Now, there&apos;re going to be two black Pioneers!" "He&apos;s not an official member of the team yet," Henry said. "Mr. Bell says he has to pass a test first. But I&apos;m sure he&apos;ll do fine. Willy is one of the best players around." Henry and Sarah strolled along the sidewalk in front of Union Steel Ballpark. The evening air was still warm, and the occasional breeze felt good. They had been walking for about a half hour now, stopping to admire the various community gardens along the way. Henry really enjoyed spending time with Sarah. Talking. Listening. And he really appreciated how she wasn&apos;t afraid to share her viewpoints, even if they differed from his. He didn&apos;t think he&apos;d ever been able to talk with anyone so freely and easily. "So, what kind of test does Willy have to pass?" Sarah asked. "I&apos;m not sure," Henry replied. "Mr. Bell wouldn&apos;t say. But we&apos;ll find out at tomorrow&apos;s practice." And then with a sly smile, Henry added, "Hopefully, it won&apos;t be a short test." Sarah stopped in her tracks and burst out laughing. She clapped a hand over her mouth, stifling her giggles. A few heartbeats later, Henry tensed, and Sarah&apos;s laughter came to a sudden halt. Ahead, a white police officer was strolling along his beat, padding towards them. Henry gently took Sarah by the crook of her elbow and quickened his pace. Policemen always made Henry nervous. He supposed as a black man, growing up in Hester, he had a good reason for that. As the policeman passed them, Henry could feel the heavy weight of his stare. His heart started to thump against his rib cage as he prayed the man wouldn&apos;t start an incident. They had only gone a few feet further, when Henry felt a creeping presence behind him. He craned his neck. Just as he suspected, the policeman was following them. "Hold on," Henry whispered to Sarah. "Let&apos;s not give him any reason to be suspicious of us." Sarah&apos;s eyes grew wide. She bit the bottom corner of her lip and nodded. "Hold up, sir," the officer called out in a gruff voice. Henry reached down and grasped Sarah&apos;s hand. He stepped to the side. The policeman was marching towards them, an alarmed look stretched across his chubby face. "Is everything okay, sir?" Henry asked. "Mr. Louis," the officer said. "I thought that was you." Henry felt an even greater tension overtake him. He couldn&apos;t imagine how this policeman might know him by name. "Yes, sir," Henry said slowly, "I&apos;m Henry Louis." The officer stopped just in front of them and gave his hat a tip before smiling. "I just wanted to say &apos;good luck&apos; in your next game. A bunch of us down at the station are rooting for you." Henry felt surprise, if not shock, wash over him. "Uh, t-thank you," he said, stammering. "I appreciate that." "I hope I didn&apos;t make you nervous," the policeman said, apologetically. "It&apos;s okay," Henry said. "Thank you for wishing me luck." "Not at all. You folks enjoy the rest of your evening." The officer gave one last tip of his hat before sauntering off. For one long moment, Henry and Sarah just stood there, staring at each other in stunned silence. I&apos;m keeping this short and sweet, since the author&apos;s notes in the pretty much summed up everything. 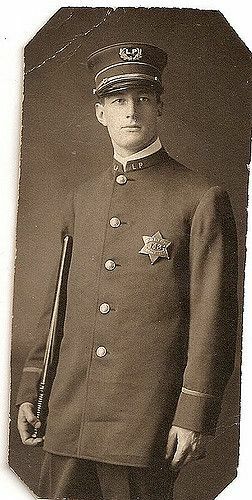 The chapter image is an actual photo of a 1910s American police officer. Once again, I know I say this a lot, but I also mean it a lot, THANKS FOR ALL YOUR READS, VOTES, AND WONDERFUL FEEDBACK!